When I was a much younger version of my current self I was given a book about beauty. I think I was about 12. The book seemed so grown up. It had all sorts of tips for plucking eyebrows and applying make-up that was a whole new exciting world waiting to be explored. It was probably about then I realised how much better it was to be me than to be a boy like my brother. He had nothing exciting to aspire to other than shaving and maybe a bit of hair-gel. I had an encyclopaedia of wonderful rituals I was going to perform. I remember rescuing the avocado peel from the kitchen as mum prepared to use this exotic and expensive treat as a starter on Christmas day . I mashed bananas and mixed them with honey and lay on the bathroom floor as the goo melted down my cheeks and into my ears. I was young, had all the time in the world and all the enthusiasm to go with it. Fast forward a few (cough) years. Welcome to the current me. I still love the idea of pampering. The only problem is that is is just that, an idea. There simply are not enough hours in the day. I'm a mum, a wife, a sister, a daughter, a Nurse, I help at school, I help at Church, I cook, I clean, I tidy up, I launder, I take photos, I blog, I try to exercise, I occasionally find time to use the bathroom. Most evenings when I finish the seemingly never ending list of "To-Do" jobs I collapse onto the sofa and snuggle next to Byron and we watch a program on the tv to try to unwind and escape mentally to another place. Maybe Bear Grylls plunging (naked) into an icy lake and eating grub larvae or Tribal wives learning about another culture or maybe Spicks and Specks, the funny Australian music quiz show that makes us laugh so loud we have to rewind to re-watch and laugh again, and again! If I was granted one spare hour each day by a magic fairy how would I spend it? Would I just let the "To Do" list expand into it? Would I sit in an arm-chair with a book? Would I exercise, learn some Yoga or maybe mash a banana? Last week I came upon a blog written by Crunchy Betty. Isn't that is a name that grabs you?! I bet the 12 year old Crunchy Betty lay on her bathroom floor as banana goo melted and ran down her cheeks and into her ears. The thing is that the fast-forwarded adult Crunchy Betty still does. She has a blog dedicated to the recipes that she loves and the ingredients that she combines to make them. She's not selling anything. She's just helping people like me discover their inner 12 year old again. 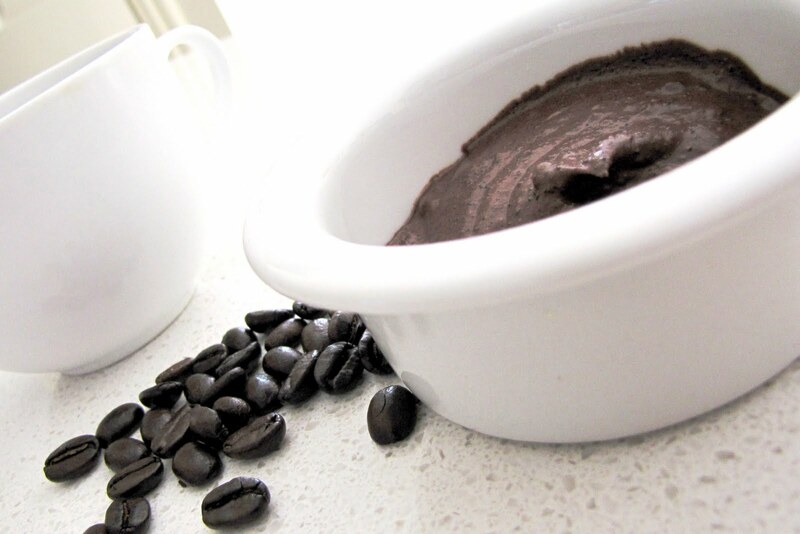 On her blog she shares the recipe for a face mask made with fresh coffee grounds, cream, honey and cocoa. I chose a day I was at home, the kids were in school and I wasn't expecting any visitors. I made myself a coffee and used the warm leftover grounds to make up the face mask. It looked and smelt like a bowl of chocolate mocha truffle. Just as I was going to disappear to bathroom floor heaven the doorbell rang. I cannot begin to tell you how grateful I was that my friend Heidi surprised me with a visit at that exact moment in time and not 10 minutes later. Heidi came bearing chocolate so I put the kettle on again so we could share it. I had a bit of explaining to do as her eyes took in the mess of my kitchen. I think she secretly wished her timing had been delayed so she could have seen me looking daft! As she left she told me It would make a good photo. And so here you are... Thank you Crunchy Betty, not just for making my face glow but for making my soul 12 again! The whole family had a massive trip to the dentist the day before Jean. Scrape and polish all around although I must admit that when I adjusted the brightness in the photo to get the window glow in the background it did magically glow my teeth too. The wonders of technology! I absolutely LOVE this post!! As I read the part about the 12 year old you, I can SO remember doing those masks and things, very badly wanting to be sophisticated! I never find the time these days, either, with all of the hats I happily wear. The picture of you is priceless! Oh, and most evenings after the kids are in bed I am next to hubby, on the couch, most likely watching a naked Bear Grylls just like you....and most nights, it feels like pampering! Love the pic, Gina! Thanks for sharing so we could laugh along. Glad you enjoyed your scrub! Hahhaha at your comment on my blog! I've been advised to have a meal and outfit prepared just in case my favourite celebrity pops by. Really! I also tried Crunchy Betty's mocha mask recently (but I was too chicken to snap a photo!) Great write-up... my inner-12 yr old self could totally relate! Oh my gosh I love this post! 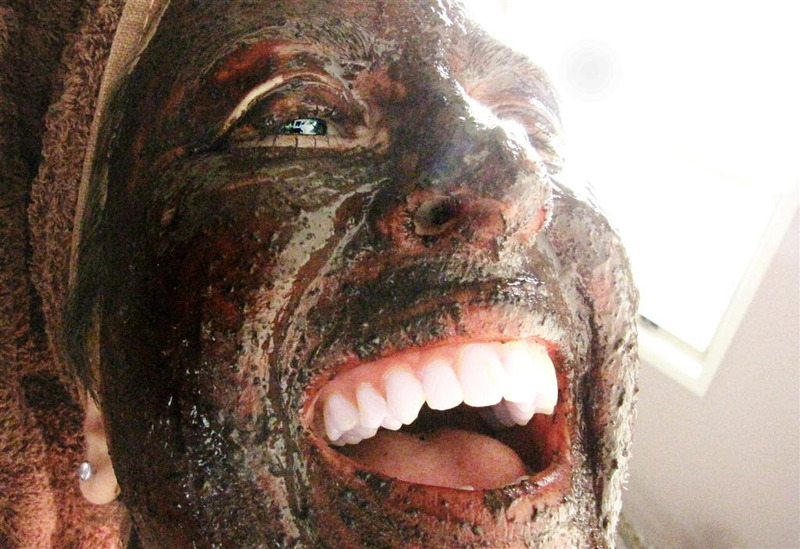 I love the image of the 12-year-old you, discovering the magic of pampering with homemade beauty treatments! And I love that you posted that photo -- you look so invigorated and joyful! Thank you for sharing that link...I'm going to wander on over there and check her blog out. Maybe I'll be laying on my bathmat tonight, giggling under a honey-and-avocado mask! 12 Week Challenge: The Finale. South African Dinner: The food.